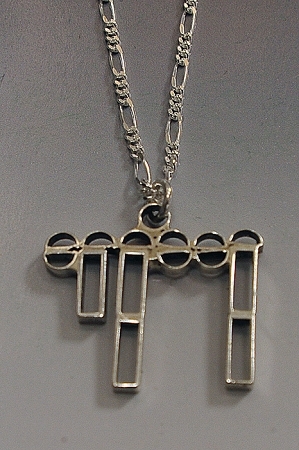 Religious Judaic Jewelry - This is sterling silver geometric Hebrew Chai pendant (translates to 'life'). This original Chai necklace is medium size and comes with an 18" Figaro chain. This charm is also available in 14K yellow gold. Chai - translated to Life. Sterling silver charm is on a 18" sterling silver chain.